A glut of blackcurrrants is not an easy thing to get rid of! I stopped picking blackcurrants at my Mother in laws allotment when we just about filled the tub we were using and I started to get worried that there was only so much blackcurrant jam one could eat, especially when my husband announced that he didn’t like blackcurrant jam! Picking blackcurrants is a bit of a pain, so many tiny berries attached to little stalks, after a while I perfected the art of pulling the berries downwards off their little stalks, thus saving much picking over later when I got home. I needn’t have bothered as I later decided that it would be much easier to make jelly which actually needs the stems for added pectin! Luckily I still had a lot of stems attached in the tub! 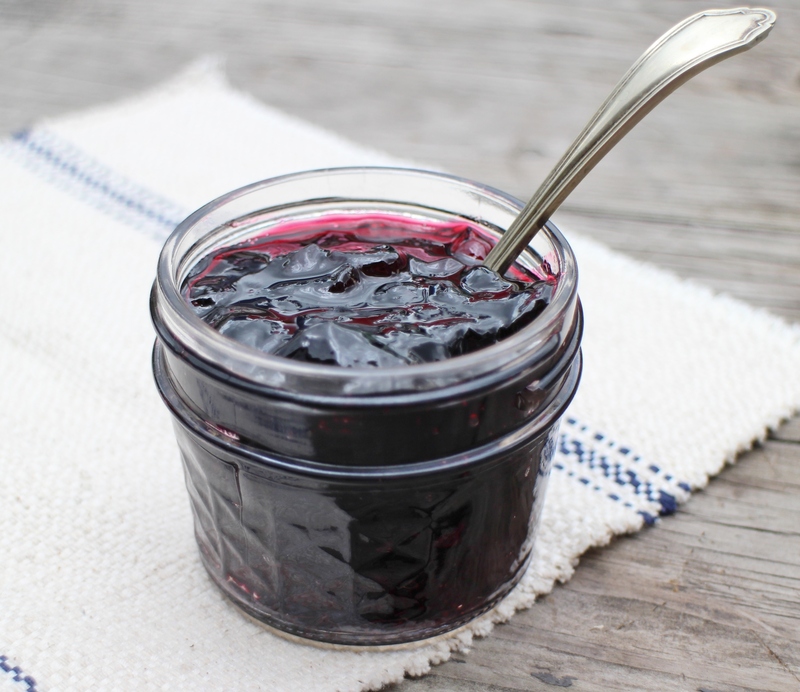 Making this blackcurrant jelly is really easy but does require some time, perfect for a rainy Sunday or make it one evening and leave to strain while you sleep. I really enjoyed the bright flavour of this jelly without all the seeds and bits blackcurrant jam has. Having rinsed and drained the blackcurrants put them in the preserving pan of your choice, a really big stock pot is good if you don’t have a special jam pan. Add the water and simmer until the blackcurrants are soft, this takes about 20 minutes. When the jelly bag is no longer dripping measure the juice. Add 1 lb of sugar for each pint of juice obtained. I got 2.5 pints of juice from my blackcurrants so needed 2.5 lbs of sugar. Put the juice and sugar into your jam pan and stir until the sugar has dissolved. Bring to a boil and boil rapidly for the setting point, mine was a little stubborn and took about 9 minutes of hard boiling, I tested after 5 minutes then at 7 minutes then at 9 minutes when finally the jelly wrinkled up on my cold plate. Test for setting, I use the cold saucer method which means putting 2-3 saucers in the freezer while you are boiling the juice and sugar. When testing for a set take a saucer from the freezer remove the pan from the heat and take a spoon of the boiling juice onto the cold saucer. Wait a couple of minutes and push the jelly with your finger if it wrinkles up its set, if no wrinkling happen then return the pan to the heat, boil for another 5 minutes and re-test for a set using another cold saucer. Pour the jelly into your sterilized jars, seal and follow your usual canning procedure. I simmered mine for 10 minutes in a water bath ( I use my large stockpot filled with boiling water). I got 7 mixed sized jars. I made this jelly again this year (2014). 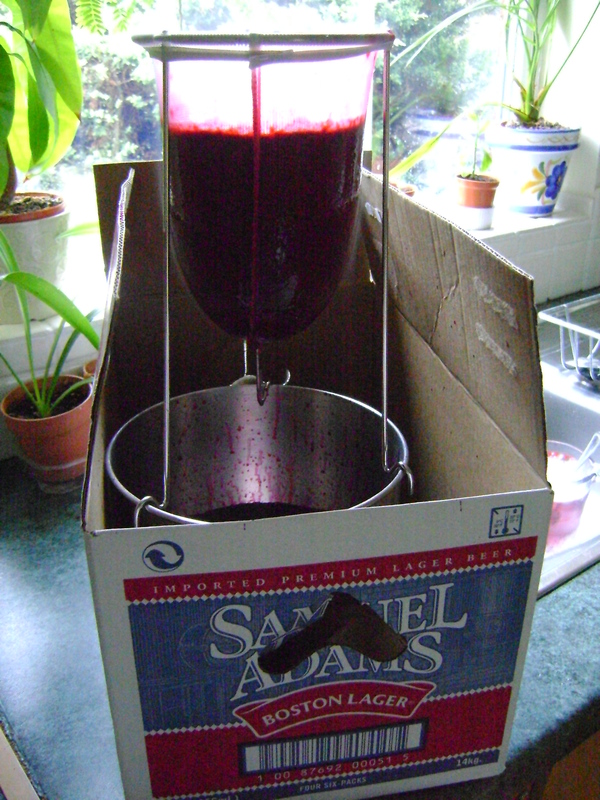 After straining my cooked blackcurrants I had 3.5 pints of juice to which I added 3 pounds of sugar and the juice of a lemon. A 10 minute hard boil and the jelly was ready, its a particularly tasty batch this year! This entry was posted on July 14, 2012, 14:00 and is filed under Canning, Jams and Chutneys. You can follow any responses to this entry through RSS 2.0. You can leave a response, or trackback from your own site. I love the color of this! I have never made black currant jam as they don’t grow here 🙂 Your set looks amazing!! I hope Andy changes his mind and gives it a go. You can use this when you make a trifle, make smoothies with it, lots of ways to use it up. Great post! Its funny I never see blackcurrants used in America yet Martha Stewart recently had a recipe for redcurrants. I was pleased with the set, thanks for noticing – praise indeed coming from you the jam Queen! I would love a blackcurrent bush as I think there are so many things you can do with them. Your jelly looks fabulous. I’m imagining it spread inside a croissant, mmmm. Thanks gor entering Simple and in Season. Thanks! One bush produces a lot of berries, more than enough to start of with. This looks just delicious, Jayne! We get some red currants, but rarely see black currants. I’m with Wendy – I love the color too! Thank you! It’s a mystery why black currants are less popular? Pinkcurrants are really pretty and getting more popular here. How interesting! Lucky they are ok to plant now. I just ordered 2 plants from Starks Nursery plus I planted Elderberries 4 years ago and made my first jelly this winter, can’t wait for the Black Currant Jelly. I have not used elderberries before, how was the jelly? Just made the jelly with a mixture of red, white and black currants. They all grow well here in Cornwall. The recipe was really useful. I am so pleased it was helpful! I love the idea of the mixed currants! Sounds lovely, let me know how it goes! Look forward to hearing how your jelly turns out! I have black currants in Idaho and didn’t know what to do with them and they were wasted for two years. I AM GOING TO MAKE THE JELLY THIS YEAR. I HAVE SOME READY RIGHT NOW TO PICK. I ALSO HAVE YELLOW CURRANTS. HAS ANYONE EVER HEARD OF YELLOW ONES? I have not heard of yellow currants, they sound good! I have seen white ones which are sort of clear looking. Does anyone know if the currants can be juiced with a steam juicer and if the jelly would turn out OK?